Although not as popular as football, handball is one of the most enjoyable games to participate in and watch for those who understand it. 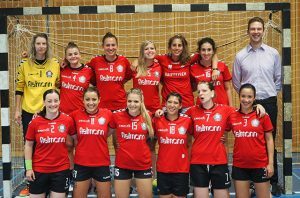 But like football, it has very straightforward rules that even a novice getting introduced to the game can understand immediately; and as far as the advancement of handball is concerned, no other institution has given so much to this beautiful sport more than London GD Handball Club. Founded in 1976 as the Great Dane Handball Club, it currently has three men’s teams and two women’s teams in both the English National and Regional leagues as well as a youth development structure across the country to generate future players for the club. Over the years both the male and female teams have recorded impressive achievements by winning successive titles in all the leagues that they have participated in. The Men’s team has been the English League Champions in the following years: 2016, 2014, 2013, 2011, 2010, 2009, 2008, 2005, 2001, and 2000; as well as finishing as runners-up in the years 2007 and 2015. They have won the Champion’s Cup three times in 2009, 2011 and 2012. They have won the British Cup Champions in the years 2008, 2007, 2006, 2005 and 2004. They also won the Weymouth Beach Handball Champions in 2007, ending up second in the previous year. On top of all this, they have won Oktopus Tournament (Eindhoven) Champions in 2005. The women have not been outdone either, winning the English League Champions in 1986, 2007 and 2010. They have finished runners-up in 2013, 2012, 2011, 2009, 2008, 2006, 2005 and 2004. They have won English Cup in 2010 and 2013. They have been runners-up in the same in the years 2012, 2011 and 2009. They have won the British Cup Championship in 1986 and 2007. As long as this great club continues to exist, then handball has a future.